This is my 1,140th post as Lagalog marks 5 years in the blogworld. When I first started, I was really clueless about blogging and asked myself what the heck was I doing writing an online journal. At first, it was to chronicle my day-to-day activities.L ater on, it evolved into a chronicle of my trips, hoping it would be of assistance to others. Along the way, I picked up lessons and made friends, some of whom are still with me up to this day. Congratulations and thank you very much for taking the time to share your pictures! You've come a long long way and from the looks of it, you've accomplished so much all because you blog and photograph from your heart. Bow ako sayo... may you have many many more excellent photographs to take and exciting stories to tell. oggie, congratulations! wow! five years of blogging is not a joke. you're one of the best bloggers that i've met. kung sana lang makikilala ka ng ibang bloggers siguradong mas magugustuhan nila ang blog mo. of the five years of blogging, ill take note of your blog as an inspiration to me to continue blogging. cheers to more years of excellent photography and exciting travels. Congratulations with your 5th anniversary... keep going...not for the next five years but for the next 50 years ! Keep going... you have a wonderful blog. woohooo! 5 years?!!! congrats bro. one of the best blogger / photographer / person i've met. alam ko kasi nakasama na ikaw couple of times eh. sana more years of blogging / travel / photography pa para sayo para marami ka pang ma inspire. dom daghan salamat bai for the support. very, very much appreciated bro. sidney, thank you very, very much sidney. you're one of the first blogfriends i idolized in my early days of blogging and i look up to you to this day. erick, salamat nang maraming marami bro. nakakatuwa ring isipin kahit papaano, i've inspired you kasi never really thought about that. salamat for all the support. nina, salamat salamat salamat po! makiki-congratulations na rin oggie the pogi. haha! thank you for bringing one of the best travel and photography blog around. congrats Oggie! pa-chiz burjer ka naman! hehe. 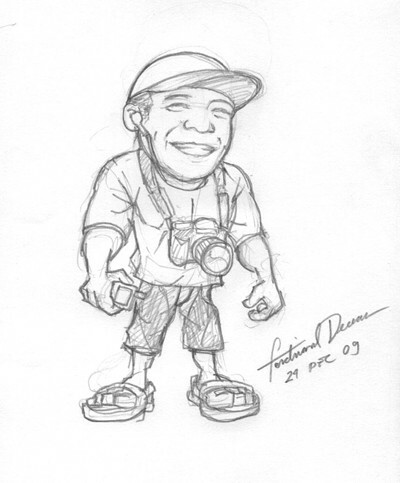 cute ng sketch. multi-talented talaga itong si Ferdz. more power, more years of blogging to come! 5 years is indeed a long time! from the bottom of my heart (also) thanks for the photos and the stories they tell. looking forward to more blogging years! congratulations on your accomplishment. that's not an easy feat. more power. Congratulations po..more blogposts,travels and photographs to come. thank you also for inspiring me in my photography..i just admire the way you capture sites/views.Keep it up! congratulations oggie! keep it up! i've always referred to your blog and wulf's blog whenever i travel in the philippines. cheers to more fun and interesting travels! can't let this pass without greeting you CONGRATULATIONS! More power to you. God bless you more and more! arlene,and i can't let this pass without thanking you. it's great to hear from you again after quite a while. God bless you too! Congratulations, Oggie! And I believe belated birthday greetings are in order, too. :) Many of us live vicariously through you, I'm sure. And for that, I am eternally grateful. Seeing this country of ours through your eyes is like seeing it the way God has designed all creation. :) Thank you, thank you so much for bringing that kind of beauty to your readers. It's priceless! God bless you more! loyva,, wow your comment made my day. i'll refer to this next time i contemplate on quitting blogging and photography. i admit, there've been numerous times in the past when the thought crossed my mind. but i hear you and i really appreciate your very kind, very encouraging words. God bless you even more!